We do not curently have theatre tickets available for Scotch & Soda This could be because we have simply sold out or it could be that this show is no longer running. The information on this page remains purely for historical and informational purposes. Providing the heartbeat of this giddy display is the Crusty Suitcase Band. The finest disarranged troupe of horn blowers, drum strikers and saxophone pipers, who underscore the action with their unique fusion of jazz and music hall. 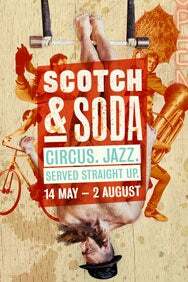 A spectacular clash of spellbinding misfits, Scotch & Soda is a guaranteed whiskey soaked evening of breathtaking feats, blinding charm and beatnik soul.